We’re officially in fundraising mode this week to raise $25,000 to install a series of eleven murals along Seventh Street, which we’re promoting as a family friendly, bicycle/pedestrian corridor linking the residents and community to businesses of the Bishop Arts District. After 24 hours, we’re up to $7,000, so we’re making our way there. Steve Cruz of Mighty Fine Arts, and Kevin Obregon of the Cube Creative, have assembled a team of recognized local artists and have submitted proposals for each of the walls. Fill out the following form and submit to the address listed inside to help us reach our goal. There are different levels of sponsorship, with a mid-range donation allowing you to have you or your business name painted on one of the mural walls. 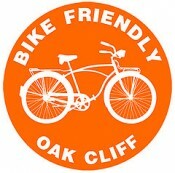 More details regarding the event will be posted at the Oak Cliff Art Crawl website. Stay Tuned! ← The Streetcar is Returning to Oak Cliff!